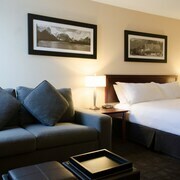 The staff was friendly and polite, the room was clean and the bed was comfy, that was all I was looking for . The hotel itself is old and tired looking. 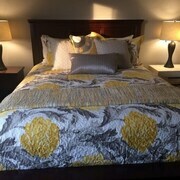 But it had everything I needed, a good bed for the night at a decent price. Nice room, great service, decent Designated smoking area. Best thing about it is the near proximity of Coulee Brew Co Pub. Amazing beer, great food and great service 3 minute walk away. Where to find Coaldale hotels near an airport? Where can I find hotels in Coaldale that are near tourist attractions? 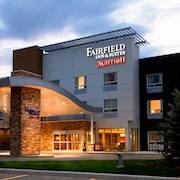 Unfortunately Expedia doesn't list hotels listed in Coaldale, but our comprehensive database offers a good selection of budget and luxury hotels in the region. There are around 24 accommodation options located within 0.1 kilometres (0.06 miles) of Coaldale. 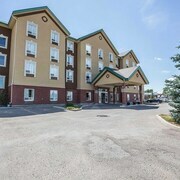 The Holiday Inn Lethbridge, Alberta, which is the closest accommodation, sits 16 kilometres (10 miles) from downtown Coaldale. Alternatively, check out the Holiday Inn Express & Suites Lethbridge, located in Alberta, which is 18 kilometres (11 miles) away. 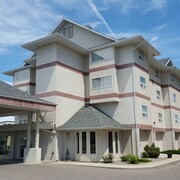 The Hampton Inn & Suites by Hilton Lethbridge can be found 14 kilometres (9 miles) away from the center of Coaldale. 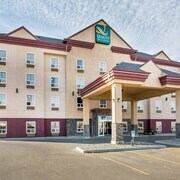 Another hotel is the Quality Inn And Suites Lethbridge, which is positioned 15 kilometres (10 miles) away. 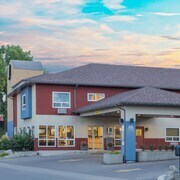 The Coast Lethbridge Hotel & Conference Centre and the Comfort Inn Lethbridge are other alternative places to book accommodation around Coaldale. After you've seen Coaldale, take a little time soak up the other natural and cultural attractions of the Southern Alberta area. Check out Southern Alberta's old towns, art museums and nature museums. Visitors should also make the time to to admire the region's rivers. Visitors and locals alike in this region of Canada often enjoy snowboarding and skiing. 35 kilometres (20 miles) away from Coaldale you'll find Taber, where you can spend the day enjoying Taber Golf Club and Taber Community Centre. If you'd like to spend a night or two in Taber, check out the room rates at the Heritage Inn Hotel & Convention Centre Taber and Super 8 Taber AB. 80 kilometres (48 miles) to the northwest of Coaldale, you'll find Claresholm, which is home to the Bluebird Motel and Motel 6 Claresholm Ab. While in Claresholm, you might like to visit the Appaloosa Horse Club of Canada Museum and Claresholm Museum. Just because you're traveling, doesn't mean you can't indulge in your passion for sport. Spitz Stadium is situated 16 kilometres (10 miles) to the west of Coaldale. For tourists who are keen on booking a room nearby, make a reservation in the Lethbridge Lodge or Sandman Hotel Lethbridge. Located 18 kilometres (11 miles) away from Coaldale is Lethbridge County Airport. Stay nearby at Premier Inn And Suites or Paradise Canyon Golf Resort. 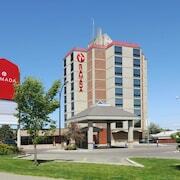 What are the most popular Coaldale hotels? Are there hotels in other cities near Coaldale? What other types of accommodations are available in Coaldale? Explore Coaldale with Expedia.ca’s Travel Guides to find the best flights, cars, holiday packages and more!